ST. AUGUSTINE BEACH, Fla. – Ocean Ridge is a rare opportunity to own a pristine, new homesite just blocks from the ocean on highly sought-after Anastasia Island. Nestled among the natural beauty of rolling dunes and majestic oak canopies, McGarvey Residential Communities’ newest development is the last planned community in St. Augustine Beach. Close attention to the environment, respecting open space, maintaining the topography, architectural elements and landscaping with native plant material are features that distinguish every McGarvey community. St. Augustine Beach resident Mark Bailey bought a homesite in Ocean Ridge. He knows first-hand how McGarvey seamlessly integrates people, architecture and the environment while upholding the integrity of each. “In the vision, planning stage and in the development phase, Jay focuses on specifics. He thinks through the details and aesthetics. That attention to detail is what makes his communities special, especially for families,” Bailey said. Having lived in another McGarvey Residential Community, Sea Colony, for five years, Bailey knew that the developer’s commitment to Ocean Ridge would create a place that’s thoughtful, unique, and where people will want to call home. “It’s first class all the way from the moment you enter a McGarvey community, from well thought out amenities that are fully maintained to landscaping and design that is very sensitive to the natural environment. That’s why our investment in a lot at Ocean Ridge made sense,” noted Bailey, president of The Bailey Group. Located at Mickler Road and 11th Street, Ocean Ridge blends Florida beach-style architecture with lake views and a private swim club. 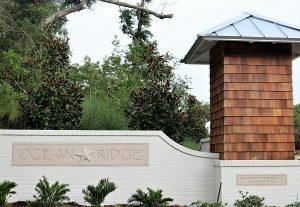 An easy walk or bike to the beach, Ocean Ridge exemplifies what has made St. Augustine Beach such a sought after location. Ocean Ridge builders, Riverside Homes and SH Design, will feature expansive floor plans, spacious master suites, gourmet kitchens and covered patios starting at 2,250 square feet. Model homes are currently under construction. Since 1980, the focus of McGarvey Residential Communities has been to “build communities that last for generations.” As a result, they have developed some of the most enviable neighborhoods in North Florida. Now, add Ocean Ridge to that prestigious list. McGarvey’s thoughtfully designed and heralded St. Augustine Beach communities include Sea Colony, Sea Grove, Anastasia Dunes and Sea View. For more information on available lots in Ocean Ridge, contact Sean McGarvey at sean@mcgarveycommunities.com or call (904) 247-9160.